The Conservation and Completion of St Mary's Cathedral commenced in February 2007, and as recent visitors to the Cathedral would have witnessed, there has been remarkable progress. Construction and conservation work is on schedule. 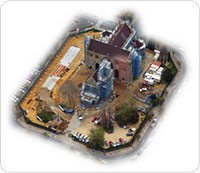 At this stage it is hoped that the "renewed" St Mary's Cathedral will officially open in 2009. Given the enormity and complexity of this project, variables such as weather and other factors, we will continue to liaise with the Project Committee on a regular basis, to ensure you are provided with the latest information on the construction and completion progress."